Portable aluminum folding wheelchair ramps- online catalog. These portable single fold aluminum ramps are strong and durable yet light in weight. The single fold wheelchair ramp folds in the middle and includes a convenient carrying handle. The ramp unfolds to a 30" wide platform that is ideal for wheelchairs and scooters. Load capacity = 600 pounds. 2" curb for roll off protection. These portable multifold extended length aluminum wheelchair ramps are strong, durable, easy to handle and set up. 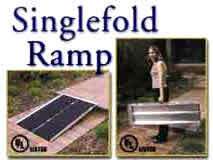 Multifold wheelchair ramps are light in weight, fold up, and can be carried like a suitcase. The ramp unfolds to a 30" wide platform that provides excellent stability and includes a high traction surface and roll off protection. This ramp is ideal for wheelchairs and scooters and accommodates various wheel configurations. Built in safety guide indicates if ramp is on a safe slope. Load capacity = 300 lbs. single axle - 600 lbs. two axles. Except: WC1030 & WC1230 =250 lbs. Single axle - 500 lbs. two axles.